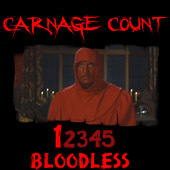 Blood madness...Out Of The Fog...Into Your Heart! The pre-Romero era of the undead has been of interest of me lately, probably because the last decade alone has seemingly produced more zombie movies than the 35 year period between White Zombie and Night of the Living Dead. Sometimes, you just want a different type of undead, plus it’s always interesting when you stumble upon something like Valley of the Zombies. That’s a title that sounds like it should have shown up in dozens of budget packs alongside its other Poverty Row brethren, but, no, this one has yet to make it to DVD at all. The zombie in this case is Ormond Murks (Ian Keith), a guy who was once committed to an insane asylum, where he died. For whatever reason, he didn’t stay dead, so he returns from the grave and is forced to steal pints of blood from the doctor (Charles Trowbridge) that had him committed in the first place. When he’s discovered skulking around the laboratory, it kicks off a series of murders, embroiling the doctor’s assistant (Robert Livingston) and nurse (Lorna Gray), who find themselves to be the suspects. Like a film noir without a mystery, plus an antagonist that’s technically the walking dead, Valley of the Zombies is expectedly flat and creaky, but, most importantly, brisk. Clocking in at less than an hour, it’s in and out of your mind rather quickly and leaves the same sort of impression as a middle-of-the-road Twilight Zone episode. What you’ll likely remember from this is a few cool establishing shots (director Phillip Ford--nephew of John--establishes the hell out of this one foreboding clock tower that’s seemingly always soaked in pouring rain) and the fact that this is technically an early “zombie” movie. I’m using that term in the loosest sense, as it doesn’t play much of a role in the plot--we’re told right up front that Murks has returned from the grave, and we know that he’s after blood to keep him alive. We also see him commit the murders that set the plot in motion, so we’re basically left with Livingston and Gray skulking around the film’s trio of sets (the office, a graveyard, the huge, abandoned Murks mansion) to clear their name. Obviously, there’s no sense of mystery or discovery here, and the movie can only go so far with the dramatic irony at the center of it all--we know these two are innocent, but the good-natured cops (and of course one of them is named Tiny) are hardly a real threat. So it’s up to Ian Kieth’s low-rent Karloff impersonation to fill out the creep quotient, and he fares okay when it comes to staring menacingly with that sunken-eyed sort of gaze that Karloff made famous. The violence he perpetrates I obviously tame by modern standards, and, of course, he eventually tries to steel away with the girl, whose charming personality has been established by quaintly witty dialogue. “If I were standing any closer, we’d be wearing the same shoes,” she says, as she clutches onto Livingston’s arm while investigating the cemetery. While there, they bump into a cow, which qualifies as the requisite fake scare. These things usually involve a cat, so Valley of the Zombies separates itself in its choice of fake-out critter. It can also claim the distinction of being one of those films that’s far less interesting than the title would lead you to believe; there’s not multiple zombies, much less a valley full of them. Instead, the title derives from an admittedly lyrical passage where Murks explains how he visited some kind of netherworld between life and death before returning. His thirst for blood is rather interesting, though that might paint him for a vampire than a zombie, though it does vaguely foreshadow the hunger for flesh that would eventually define the latter. He’s also a master hypnotist, apparently, a skill that he breaks out late in the game, so maybe it isn’t accurate to say there aren’t multiple zombies after all. At any rate, this is yet another one of those post-war 40s efforts where noir was swallowing horror a bit. You can feel that genre’s influence more than any other, with Murks’s undead status being the only thing that even pushes it into horror territory. 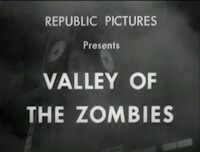 Hailing from Republic Pictures (basically a conglomerate of other Poverty Row studios), it’s no surprise that it feels like a quick attempt to cash in on the early zombie craze (which was already on its last legs at this point) and film noir. Unless whoever owns the rights also happens to have a stash of other similar films lying around, I’d be surprised to see Valley of the Zombies get a DVD release. This is the type of movie that Netflix Instant was made for, and I hope studios continue to dump these weird, rare oddities that otherwise wouldn’t move 9 copies off of store shelves. Typically, there’s a reason for that, and, in this case, it holds true--Valley of the Zombies isn’t very good, but if you’re curious enough to explore early incarnations of a popular horror trope, it’s worth popping into your instant queue. Rent it!